A1: When manufactures of lithium cells build batteries, careful consideration is taken to choose matching cells to build the battery pack. The batteries are assembled by the manufacture that is experienced and certified to test and assemble battery packs. The individual cells are tested and sorted by machine so that each ePOWER B-TEC battery pack has matching cells with the same capacity and internal resistance. Paralleling individual lithium batteries like the ePOWER B-TEC unit is like taking out a lottery ticket. There is a million to one chance that you would end up with two lithium batteries off the shelf at your local retailer with exactly the same capacity & resistance. When assembling lithium-ion cells into functional battery packs, it is common to connect multiple cells in parallel. When lithium ion battery packs are connected in parallel and cycled, matching of internal resistance is important in ensuring long cycle life of the battery pack. Specifically, a 20% difference in cell internal resistance between two battery packs cycled in parallel can lead to approximately 40% reduction in cycle life when compared to two batteries parallel-connected with the same internal resistance. Internal resistance mismatch becomes an important problem for applications where the lithium battery packs are paralleled and subjected to high C rates, (i.e. large inverter loads and moderate to high charge rates) and are also required to have a long cycle life. The detrimental effect of internal resistance mismatch between parallel-connected batteries arises because differences in internal resistance lead to uneven current distribution and capacity between the batteries, resulting in a decrease in battery pack life and performance. 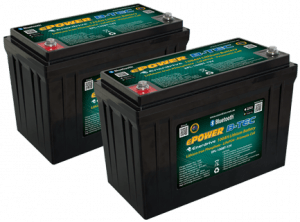 The ePOWER B-TEC batteries internal management system (BMS) monitors and optimize each single prismatic cell within the battery during charge & discharge. However the BMS does not have the ability of making a physical connection to a second BMS system for balancing of the cells between each battery. A2: In series connected batteries, charging and discharging is inherently limited to the condition of the ‘weakest’ cell. This is particularly so with lithium-iron (LiFePO4) batteries. A weaker cell would cause an imbalance. A weak cell may not fail immediately but will get exhausted more quickly than the strong ones when under load. On charge, the low cell fills up before the strong ones because there is less to fill and it remains in “over-charge” longer than the others. 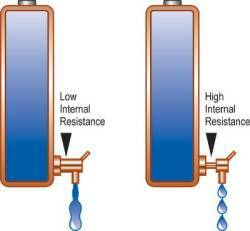 On discharge, the weak cell empties first and gets hammered by the stronger cells. Cells in multi-packs must be matched, especially when used under heavy loads. Again, the chances of finding two ePOWER B-TEC batteries off the shelf, with exactly the same individual cell capacity in each battery would be near impossible. Can I parallel connect the ePOWER B-TEC lithium batteries? The short answer is yes. BUT as described above, overall performance of the battery pack and life expectancy will be reduced. Can I series connect the ePOWER B-TEC lithium batteries? The short answer is no. Early failure of the battery pack is virtually guaranteed due to the mismatch in cell capacities. PLEASE NOTE: For absolute maximum performance and lifespan, Enerdrive do not warrant the ePOWER B-TEC product in a parallel or series connection configuration. If you are requiring a larger battery system than the ePOWER B-TEC battery, please look at the Enerdrive Lithium Power Pack Systems which can offer the level of cell/battery balancing protection.